1. Are you open this Sunday, Mother’s Day, Father’s Day, Easter Sunday? Yes, we are open EVERY Sunday. There is a mid December break, which will be stipulated, closer to the time. 2. What are the market hours? Market opens to the public at 9am. All Market stalls close at 3pm. Exit closes at 4pm. 3. Can we book a table or a specific space? No, we are essentially an open communal space. No area may be blocked off to exclude or impact others’ enjoyment of the market. 4. We’re celebrating an engagement, birthday party can we bring our own snacks/ sweets/ cake/ drinks into the market? No food or drink may be brought into the market space. Only food/drinks purchased from our vendors may be consumed on the property. We have amazing bakers and all of our vendors produce excellent platters. 5. Can we book the market as a venue for private parties/weddings/functions outside of market hours? 6. Can I bring my pet to the market? Dogs must be friendly with other dogs and children. Dogs must be with the owner at all times. 7. Are you open on public holidays during the week? 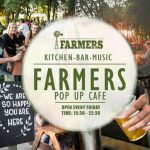 We are open every Friday from 15h30 to 22h30 for our Farmers Pop Up Café and Bar. 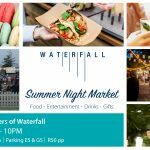 Any additional specialist and/or night markets and events are announced on our home page, Facebook page, Instagram or Twitter feed. 8. Are you open on rainy days or if rain predicted? Yes. Joburg is famous for its brief, summer thunderstorms so we try to open rain or shine. Please follow our Facebook, Instagram page or Twitter feed for live updates if more severe weather is expected. 9. How do I book a stall? We are constantly sourcing new and interesting vendors. To find out how you can apply, visit the Vendor section of our website. We keep all applications filed and will contact you if we love your unique product and when we have a space available. 10. How long is the vendor waiting list? Our waiting list for traders is extensive and unfortunately we can give no indication how long you will need to wait. We select new traders on merit when a position becomes available. 11. Who do I contact to play music at the market? 12. Can I use Credit Cards? Absolutely! Most of our vendors have credit card facilities as well as Snap Scan. 13. Can I draw money? For safety reasons we do not have an ATM and we are in the process of becoming a cash free market. 14. Do you support any charities? The market sponsors numerous charities and we are always happy to hear from you. We allocate at least one station to a charity per week. Contact us @ info@ffmarket.co.za for more information. 15. Do you have baby changing facilituies? For the convenience of all of our parents we have recently ugraded our baby changing facilities. 16. Do you offer healthy children’s food food? Fussy eaters? Worry not. We have an array of child-friendly meal options on offer including fresh fruit juices, bubble teas and smoothies, pizza, sushi and macaroni cheese. 17. Do you have sufficient parking? Parking on the property is limited. There is ample additional parking available at our neighbour, Montecasino and reserved handicapped parking is available at the entrance of the market. 18. Do you offer Vegetarian, vegan, organic and gluten free meals and products? We do have vendors, who cater for Vegan, vegetarian, organic and gluten free customers and we are constantly sourcing new and interesting vendors to create the best specialist cuisine for you. 19. Is there an Entrance Fee? We charge a R10 entrance fee to ensure that we can provide patrons with the finest entertainment in Jozi and create a platform to showcase the very best in South African music. On any given Sunday we have a minimum of four, new, up-and-coming bands/artists on our stage.